I had no plans of upgrading my camera, but found out about a great deal that a member posted on the hv20 forums. The website samys.com has a refurbished HV30 model for $450. I decided to look on ebay and see what my camera, the previous model, the HV20 would sell for. I was amazed to see that used ones sold roughly between the $450-$550 range. I decided to go ahead and order the HV30 and then promptly put my HV20 up on ebay. Instead of an auction I decided to try a fixed price listing at $500 and had the option for potential buyers to make an offer. Over the last couple of days, I had offers ranging from $200-$400. I counter offered at $450, but no one took it. I then had one of the potentials who lived in Australia offer the $450 if I would ship it out today, so he could have it in time for a shoot he was doing. In the process of working out that deal someone hit the buy it now of $500 and got it at the full price. I’m really happy it worked out this way because with the ebay fees and such I pretty much break even with the new model. I can not believe it has now been a decade since 1999. 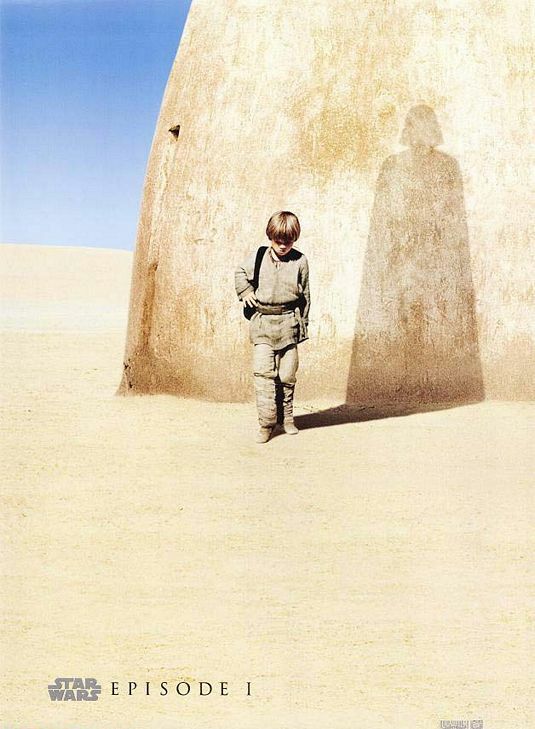 That was a big year for a lot of reasons, but one of the biggest for me was the first new Star Wars movie in 16 years. It was close to this time that the first teaser trailer for The Phantom Menace was released. I was in England at the time and I remember that the trailer showed up with The Prince of Egypt. I went to that movie just so I could see the trailer. Also, Hasbro released a couple of sneak preview figures early on. I missed out on most of the Episode 1 marketing blitz, but Paul was nice enough to pick up one of these for me. Marketers went overdrive with the Episode 1 merchandise, so even by the time I got back home a lot of it was on clearance. 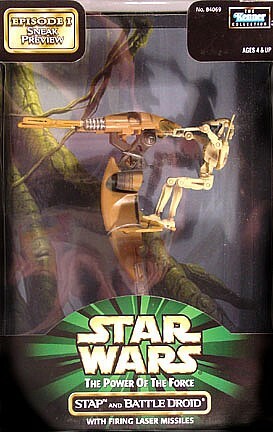 I picked up the main characters and the Naboo Starfighter, but other than that I didn’t go too crazy. Is 3D the next big thing? 3D seems to be making a huge comeback lately. Last year I saw the Journey to the Center of the Earth in 3D and was amazed at how well the quality was and the 3D effects. Instead of using the typical red and blue glasses you use glasses with a tinted lens. Last Month Sarah and I saw My Bloody Valentine 3D and again it was just as good. The movie itself was better than I thought it would be and the 3D effects were a lot of fun. One part you have this old man looking for the killer on his front porch with a shotgun pointed right at you. The other day we were at Target and because of the release of the new Friday the 13th movie Paramount re-released some of the original movies. One of these releases was the 3rd movie which was released in 3D in the theaters. 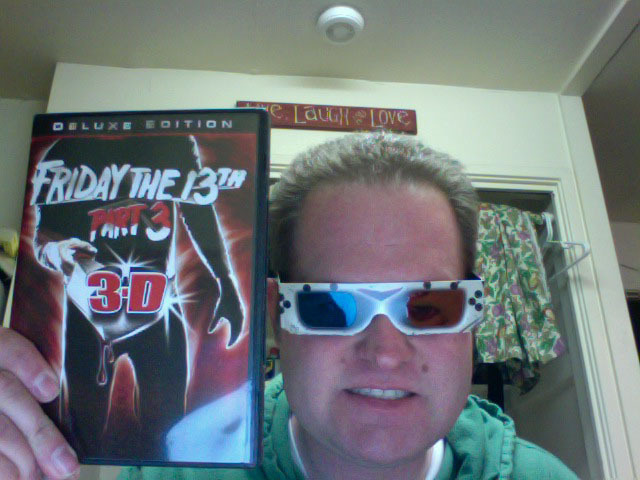 This new DVD release also included the 3D version of the film and came with 2 sets of 3D glasses. Because of home 3D technology right now you still have to use the red and blue glasses. It does kind of mess around with the colors of the movie, but the 3D effects were still pretty good. One part which particularly stood out was when Jason shoots a harpoon at someone and the harpoon goes straight toward the camera. It would be great to get the same quality at home as the theatre. I have done a little research on the subject and it looks like soon we’ll start seeing 3D compatible HD TVs. Some of these TVs were shown off at this years CES. The question about it though is will people want to invest in it? I think if the trend continues it will probably be a yes. A few years ago George Lucas also said he wanted to release Star Wars in 3D. I honestly hope he still plans to do this now that I have seen how the technology works. Here is an article about the new HD TVs on CNET.com I hope the trend continues, so we see releases of some of these classic 3D movies. I remember one of the Jaws movies being in 3D and one of the Nightmare on Elm Street movies also having some 3D scenes. 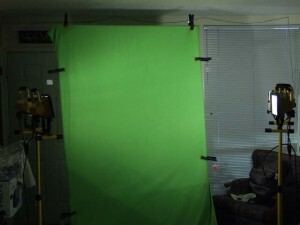 Here is a picture of my setup in our small living space. Luckily the whole thing is made of pvc pipe and can be taken a part for storage. Finally, I did not come up with the whole idea by myself. There is a great website called Indy Mogul that has all sorts of videos for DIY stuff like this. I used their tutorial and the whole thing came out to about $40. 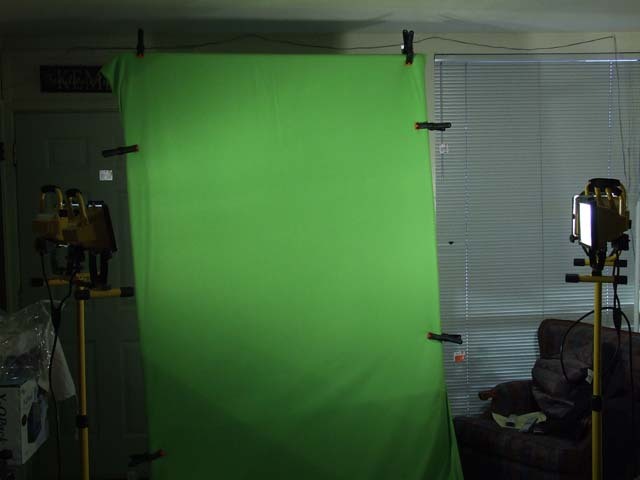 A Professional green screen costs a lot more than that. Here is their video showing how to build one for yourself.